ONE brings organic sound and super low latency sample playback to the modular. 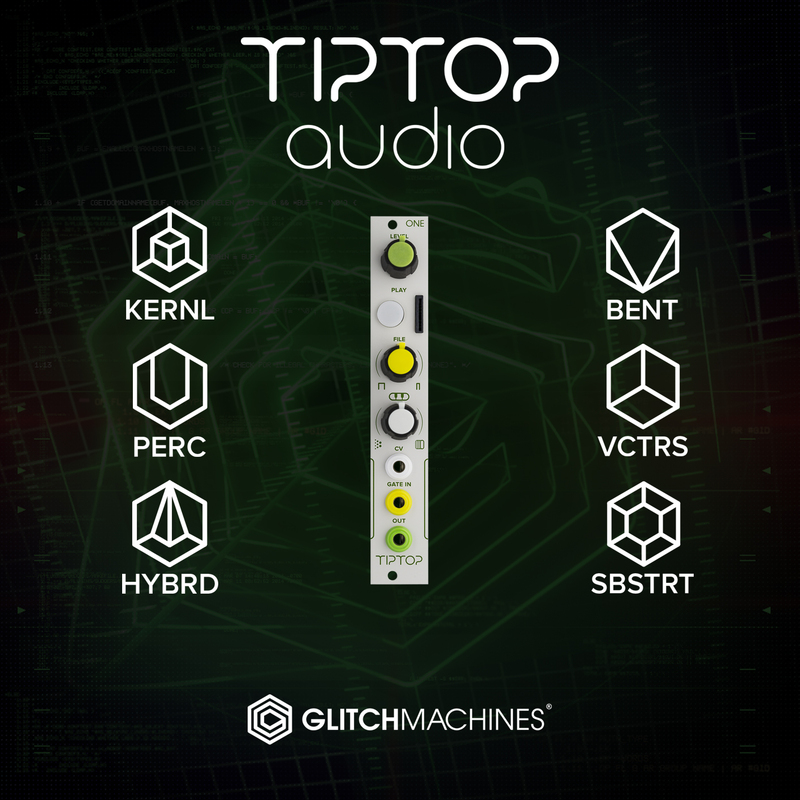 ONE comes with a free bank of 60 sounds, and 5 additional Glitchmachines MicroSD sample banks are available at Eurorack dealers worldwide. With a delay as low as 0.25ms from the moment the trigger hits, ONE offers harmonically dense, clear and detailed audio with a great rhythmic feel. For more info, visit the Tiptop Audio website. ONE includes VCTRS, featuring 60 carefully chosen sounds from the 5 sound banks developed by Glitchmachines. We have included some of the most compelling material from each bank in order to showcase ONE’s strengths and demonstrate the broad range of sounds available on the PERC, SBSTRT, KERNL, HYBRD and BENT cards which are available separately from Eurorack retailers. VCTRS and the other Glitchmachines cards include the entire sound set sampled at 48kHz, 64 kHz and 96kHz. BENT features 256 sounds harvested from a variety of customized circuit bent instruments. We recorded an exhaustive collection of bent vintage educational toys and toy keyboards that were all hand-built by sound designer Ivo Ivanov over the course of five years. The lo-fi character of this bank is perfectly at home in the modular synth domain and compliments its already vastly diverse sonic landscape by injecting it with a nuanced and rare set of sounds that can be integrated as percussive effects along with existing modules. PERC features 256 percussion sounds with tight attacks and a bright harmonic spectrum. This diverse collection is specifically focused on shorter percussive samples and includes material such as multi layered drum & percussion hits, chopped & processed loops, synthesized FM strikes, mallet and bell tones, sampled drum machines, various toms and hand drums, obscure noise boxes, digital stabs, sampled oldschool game chips and much more. PERC makes full use of ONE’s snappy character. KERNL features 256 ultra-modern layered and processed sounds with distinct percussive qualities specifically geared toward use within the modular ecosystem. You will find a carefully selected set of sounds captured on the surface of an imaginary world somewhere deep in the mind of sound designer Ivo Ivanov. This library includes hyper-stylized impacts, mutated organisms, twisted robotic vocalizations, morphing textures, biomechanical malfunctions and otherworldly articulations that defy categorization. HYBRD features 256 Foley and field recordings that have been treated with a wide range of binary manipulation techniques. We have carefully used just the right amount of processing on a diverse collection of freshly recorded natural sounds in order to give the material a unique and stylized electronic aesthetic. These sounds have familiar undertones, but are presented in creative ways that suggest they belong to a sonic universe of unknown origins, making them right at home inside your modular synthesizer. SBSTRT features 256 recordings of natural sounds, which were created by manipulating various materials such as metal, stone, plastic, wood and liquid to name just a few. Everyday sounds you may hear in a construction site, warehouse, traffic, crowd, factory, subway, park or office have been prepared for integration into the modular synth. These raw & unprocessed sounds were crafted to highlight their percussive qualities, making them an ideal counterpart to the electronic modular sound palette.